Scar killed Mheetu. Mheetu is nalas' brother they didnt onyesha that part i dont know why but it is true wewe can even look at Google. 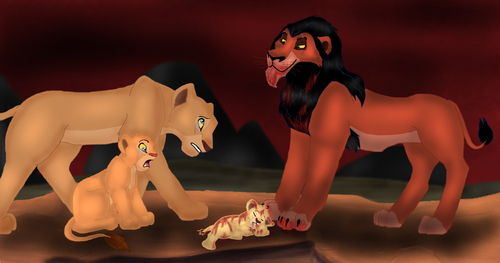 HD Wallpaper and background images in the Lion King club tagged: scar killed nala's brother mheetu. Also, Scar never killed Mheetu, because Mheetu isn't even a real character since he was cut out of the movie. i feel bad for nala!!! Wasn't mheetu scar'son??? Scar is the craziest lion in the world!AND he wanted to kill simba and mufasa to. What does any of this matter? Any of these so-called characters that were cut out of the movie or what not aren't there. Why do you all worry about them so much? I thought he DID kill Mufasa...Scar, DIE. Seriously, officially it's not known who Mheetu's father would've been and nothing happened to Mheetu because he was simply CUT out of the movie universe, not written out. oh i did not know Mheetu was Nala's brother i bet that was very sad for nala and her fam. Is that why Mufasa hated Scar? ugh............1st he kills mheetu den mufasa..........den why didn he kil zira n kovu???????!!!!!!!!!!!! Much as Mheetu is cut out but by seeing is pic is true of how actual male lions do to cubs. When a new male takes over a pride he kills the existing cubs and mate with the females to carry his cubs. So when Scar took over, he kills the existing cubs, for some reason he doesn't kill Nala but this is only fanfic. It's a sad pic, though.